Our dance school is happy to serve the needs of the growing East Windsor and Monroe communities in offering creative Bollywood Fusion dance classes for Boys, Girls, Teens and Adults. We are minutes away from Hightstown and Monroe Township and near to Exit 8 of the NJ Turnpike. We have convenient weekend classes being taught by caring and experienced dance professionals who have in depth knowledge of both Indian Classical Dance, Bollywood and Hip Hop. 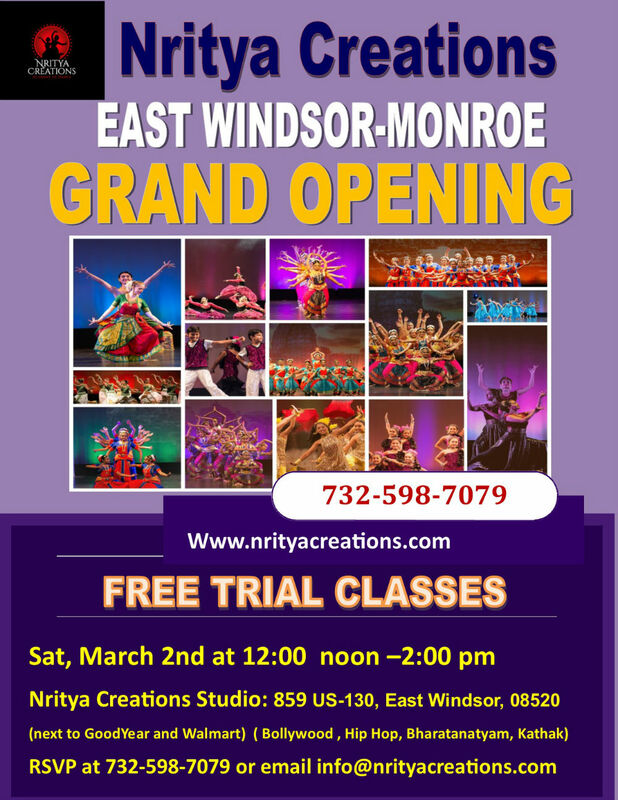 Our East Windsor students perform with our Central and South Jersey Centers and have represented Nritya Creations at many cultural shows and events. We look forward in expanding our class offering in East Windsor to meet the demands of the growing local community. To schedule your visit and observe a dance class in progress at our East Windsor location, call (732) 598-7079.